Introducing an important new expression of management science called the Theory of Constraints (TOC), this book helps busy executives and professionals quickly learn and implement TOC principles. 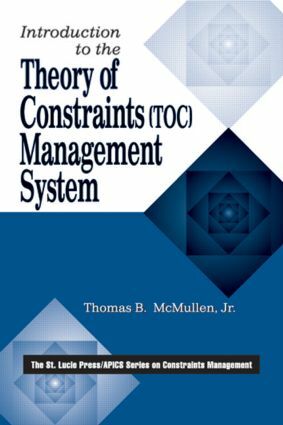 Introduction to the Theory of Constraints (TOC) Management System organizes several proven TOC principles, processes, and solutions into a TOC management system that has been successfully applied to everything from manufacturing industries to health care. The Theory of Constraints is based on the scientific method that has been developed and refined for nearly three decades by Dr. Eli Goldratt. The TOC management system offers management techniques that are sound, practical, and can be applied to nearly every company, project, or personal endeavor imaginable. It has created fundamentally new ways of managing, and has dramatically improved the ability of hundreds of thousands of individuals to make smart decisions on a daily basis. If you've read Eli Goldratt's bestselling books and wondered how to put his ideas to work, Introduction to the Theory of Constraints (TOC) Management System tells what TOC is, where it came from, who uses it, and how to get started with it.